I found these two Eastern Phoebes (a1 & a2 are the same bird as are b1 & b2) at Florence River Park. This Phoebe had a fairly strong yellowish wash across it's belly that got washed out some in my photos. We do get Eastern Phoebes every year at this nice little park along the Arkansas River. However, I have been to this location several times over the past month but have not seen any Eastern Phoebes so these are likely engaged in post breeding dispersal. While birding in Red Canyon Park, which is about 10 miles north of Canon City, yesterday I had the good luck to be where a mixed flock was eating it's way past. There were 2 Plumbeous Vireos, one of which is in these photos, plus at least 2 Juniper Titmouse, and several Chipping Sparrows (or maybe just moving through in their own small flock at the same time as the others). 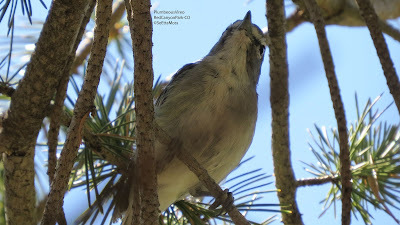 I was just inside the branches of a pinyon pine tree when I got the photo above as the Plumbeous Vireo foraged less than 2 1/2 feet from my head. Also foraging a few feet away was a Juniper Titmouse--what a fun experience that was for the minute or so it lasted to be ignored like a limb on the tree. 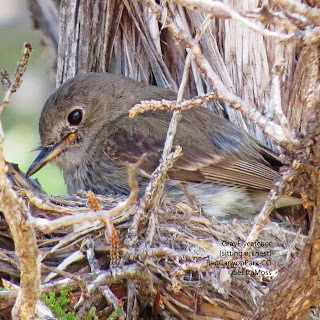 I found this Gray Flycatcher on the nest a few weeks ago in Red Canyon Park about 10 miles north of Canon City,CO. I took all the photos from inside my car with a 1200mm zoom equivalent (or 50 times the normal view) to minimize disturbance. And since I did not walk close to nest there was no danger of a scent trail that predators could follow. This female bird seemed to settle onto her nest comfortably. 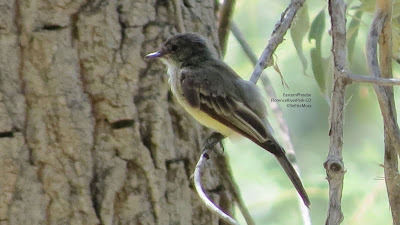 Red Canyon Park, which is one of the city of Canon City's 'mountain' parks, has excellent pinyon-juniper habitat so hosts breeding Gray Flycatchers as well as other 'pj' birds. However, we have had a severe drought for past 3+ consecutive years so the habitat had suffered and many birds were not nesting or even occupying this or similar habitat in this area. The photo below shows the juniper tree in which the flycatcher nested.